For over four decades the Eclectic Paradigm has experienced a myriad of interdisciplinary advancements and evolved into an ever-broader and complex accumulation of different macro- and micro-level concepts. 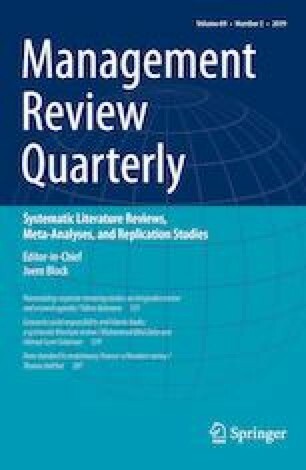 Despite its persistent validity for research on multinational enterprise activity, subject-related studies have often failed to correlate to previous findings and have independently drawn upon various versions of the Eclectic Paradigm, which exacerbates the comparability of the respective results. Yet, the literature lacks a systematic analysis of the heterogeneous development within a consistent body of knowledge. This paper contributes to the contemporary debate in that it systematically reviews and classifies the diverse developments within a unified context and, consequently, synthesizes and integrates the extant knowledge into a state-of-the-art presentation of the Eclectic Paradigm. Here, the study has set out to provide future research with a coherent basis and conceptual starting point. At this, a systematic literature review is conducted, analyzing 66 journal articles published between 1980 and 2017. Deduced thereof, the study (i) scrutinizes the largely neglected basic prerequisites (intention, underlying context, level of analysis), (ii) analyzes the imperative developments of the Eclectic Paradigm, and (iii) encapsulates the above within a coherent, state-of-the-art macro-level envelope of the Eclectic Paradigm. In light of the findings, the study concludes by identifying issues that deserve more attention or remain under-researched and, hence, provides suggestions for further research. I would like to express my very great appreciation to the editor and the two anonymous reviewers for their insightful comments and constructive criticism. This has been immensely helpful and provided a valuable impetus to revise the paper. Moreover, I am deeply indebted to Professor Tobias Dauth (HHL Leipzig Graduate School of Management) and Professor Sushil Khanna (Indian Institute of Management Calcutta) for providing insights and expertise that greatly helped shaping the research as well as for their valuable comments on prior versions of the manuscript. To study the development of the Eclectic Paradigm, the publication period (1980–2017) was divided into four segments: 1980–1989, 1990–1999, 2000–2009, and 2010–2017. The review showed that IB research has only started to critically deal more intensively with the Eclectic Paradigm since the mid-1990s. Approximately 80% of all 66 studies identified through the systematic research were published in the second half of the designated period, i.e. from 2000 to 2017. Furthermore, the analysis indicated a slightly more pronounced focus on empirical publication within the first half of the period (1980–1999) (about 58%), whereas the second half experienced an increase in theoretical/conceptual publications (about 69%). The shift of emphasis from empirical to theoretical/conceptual research can be ascribed to inter alia the growing application of the Eclectic Paradigm within related and adjacent subject areas and the associated augmentations of advancements hereunto. Indeed, the literature has presented several adaptations to the Eclectic Paradigm, yet only little of these have been empirically tested or validated. This is exemplified by the fact that 70% of the literature adapting the Eclectic Paradigm is theoretical/conceptual in nature and, in turn, a mere 30% is corroborated by empirical evidence. Especially within the second half of the period, over 44% of publications presented adaptations compared to 25% in the first half, amounting to a cumulated 41% for the years 1980–2017. The application and synthesis of the Eclectic Paradigm amounted to 26% each for the same period. However, at this, different versions and specificities of the OLI taxonomy have been adduced as a theoretical basis. A scarce 7% of the studies, yet all theoretical/conceptual in nature, demanded a supersession of the Eclectic Paradigm or claimed that it failed to serve its purpose, hence proposing alternative models. When turning to the focal determinants of the respective contributions, the majority (80%) dealt with ownership advantages. The prevailing interest can be ascribed to the fact that the most controversial debate within the literature concerned the validity and necessity of the mainstream ownership typology. To put it succinctly, one research stream, mainly consisting of internalization theorists, questioned the entitlement of Dunning’s ownership advantages to represent an independent category (e.g. Rugman 2010; Itaki 1991), whereas another stream reacted hereupon by defending their choice (e.g. Eden and Dai 2010; Dunning 1995). Others, for example Alcácer et al. (2016), Lopes (2010), Lundan (2010), Dunning (2000) or Boddewyn (1988), have devoted their research primarily to the general constituents of the ownership typology, whether by criticizing or defending the status quo as well as providing new alterations. Location advantages have been covered by 72% of the studies, whereas not as controversially as the former, since they were commonly perceived as the sine qua non to the theory of internationalization. With the emergence of the institutional framework and its incorporation from various perspectives into the ownership and location taxonomies in the second half of the period, the discussion has been further stimulated and yielded several adaptations (e.g. Mbalyohere et al. 2017; Godinez and Liu 2015; Pitelis 2007; Li 2007; Mudambi and Paul 2003). However, most contributions have been independently developed, notwithstanding possible overlaps or pertinent foundations, resulting in a plethora of different institution-based adaptations. Other than the previous two determinants, internalization advantages have not experienced the same attention amongst the studies (62%). Indeed, the internalization taxonomy was seldom approached independently but rather in conjunction with the ownership and, albeit less frequently, location taxonomies. Only few authors have gone beyond rather perceiving internalization advantages as a given, by critically scrutinizing their role within the OLI triumvirate (e.g. Alcácer et al. 2016; Scott-Kennel and Enderwick 2004; Singh and Kundu 2002; Whitelock 2002; Pan 1996; Johanson and Vahlne 1990). Likewise, international investment motives have hitherto been given relative modest attention. However, they have been introduced rather late and as an appendage to the OLI taxonomy (Dunning 1988a), with Banerji and Sambharya (1996) being the first to attend to the matter. Not surprisingly then, only one third of the present studies dealt with MNEs’ motives to internationalize. Amongst those 22 articles, 54% provided empirical evidence. Yet, it still seems that their structure, or rather the definition of the motives’ categories remains ambiguous (e.g. Cuervo-Cazurra and Narula 2015; Meyer 2015; Narula and Santangelo 2012). Consequently, several preliminary inferences can be drawn. Due to the increasing intertwining of contemporary research fields within and adjacent to IB, especially during the latter two periods, a growing cross-disciplinary interest in the Eclectic Paradigm has emerged. Yet, we can conclude that the field has predominantly developed theoretically/conceptually into various directions (a multidisciplinary instead of an interdisciplinary development) that have not been covered by empirical validation. As a consequence of the rather heterogeneous proliferation, both theoretical/conceptual as well as empirical studies often failed to correlate to previous findings, hence restricting a consistent development of knowledge alongside a coherent theoretical basis. The antecedents of MNE theory can very well be retraced to the emergence of the neoclassical theory after 1870. Yet, at the time rather neglected by the prevailing mainstream economic thought or subsumed within a generic analysis of markets, the MNE was treated as a black box (Dunning 2003b, p. 109, 2015, p. 120). With the changing developments in international activity in the 1960s, such as the prevalent emergence of intra-industry trade and the rise of US foreign direct investments (FDI), the economic field saw a growing empirical attention towards the modern theory of MNE activity (Cantwell 2015; Dunning 1993a, 2015; Denisia 2010; Hennart 2009; Buckley 1985). The proposition, which was initially put forward by the contributions of Hymer’s theory of monopolistic advantage (1960) and Kindleberger’s structural market imperfection theory (1969), embarked upon the notion that foreign MNEs must possess some idiosyncratic advantages in order to compete successfully against domestic firms on their home turf, thus compensating for the MNEs lack of knowledge regarding the indigenous market, business conditions as well as the general local environment (Zhou and Guillen 2016; Dunning 1993a; Buckley 1985). As a consequence, the focus of discussion shifted away from the theory of capital movements or location towards the theory of market failure and the ownership endowment approach, respectively (Dunning 2015), since in a state of general equilibrium, i.e. in a perfect market, FDI and, hence, MNEs could not exist (Hennart 2009; Dunning 2003b; Buckley 1985). However, neither the neoclassical theory of factor endowments nor the theory of market failure explained international production sufficiently by itself (Dunning 1980). Thereupon, Vernon (1966) has built a bridge by demonstrating the interplay between firm-specific and location-specific advantages within his product cycle theory (Dunning 1993a, 2015). Notwithstanding, both pioneering streams failed to pay sufficient attention to the type of advantages arising from the internalization of foreign activity. As a consequence, the 1970s experienced a further shift in emphasis from expounding FDI to amplifying a more holistic focus on the raison d’être of MNE activity, particularly vis-à-vis internalizing international intermediate product markets (Cantwell 2015; Dunning 1993a, 2003b, 2015). In essence, Buckley and Casson’s internalization theory (1976) predicted that MNE activity is positively related to the respective costs associated to the coordination of foreign markets. In other words, because of the existence of certain market failures and imperfections, respectively, MNEs will internalize external markets if the relative cost–benefit ratio positively prevails those of other market transactions. Yet, Buckley and Casson treated ownership and location advantages as rather exogenous and, in the case of the former, as merely reflecting internalization advantages (Cantwell 2015; Hennart 2009; Pitelis 2007; Dunning 1993a). The Eclectic Paradigm was first introduced as the Eclectic Theory on the “Nobel Symposium in Stockholm on The International Allocation of Economic Activity” in 1976 (Dunning 1977, 1988a, p. 1; refer to Dunning 1981a for the reasons for the change in terminology). The initial train of thought, however, dates back to Dunning’s (1958) PhD thesis, albeit not yet applying the OLI terminology or nomenclature herein. The conceptual insights of the Eclectic Paradigm, including the interrelated upstream economic analysis of the neoclassical theory of factor endowments and the theory of market failure, have eventually been presented within the endowment/market failure paradigm of international production (see Dunning 1988a, p. 12), which can be interpreted from a process-based viewpoint. In essence, Dunning (1977, 1979, p. 275) has explicated that the principal hypothesis of the Eclectic Theory is fourfold. Initially, the raison d’être for international production is, ceteris paribus, based on international market failure. Thereupon, an enterprise’s engagement in FDI is dependent on the satisfaction of three sequential conditions: (i) the possession of net, idiosyncratic O advantages when exploring a particular market vis-à-vis the respective indigenous competitors; (ii) the advantageousness of inter-firm transaction in lieu of external or contractual market transaction in order for the firm to exploit its competitive O advantages internally; and (iii) a higher profitability when utilizing the firm’s O advantages along with certain factor inputs outside its home country due to certain non-transferable assets supplied by the particular foreign market.